Tom Elliott & Peter Sabbagh, the boys who make up Korky Buckek one day downloaded a pirated version of Ableton (shhh don’t tell) and had a bit of a muck around. Cut to 2018, they are turning out bass-heavy electronica that is grabbing the attention of tastemakers and seeing them playing festivals (Mountain Sounds, HARD Festival, The Plot), supporting big names like What So Not and LDRU and smashing out their own headline shows. Drawing various inspirations from 90s soul, disco, rock, house and hip-hop, labels like Dirtybird and OWSLA, as well as a collection of their contemporaries that they share studio space with, including Kwame, Savour The Rations, Half Nelson, Lauren and Kymie. This blend of influences comes through in their music, and tunes like ‘All On You feat. Kwame’ showcase their bold but refined style, many of which have charted on triple j Unearthed and received additions to FBi Radio, triple j Unearthed Radio & Spot plays on triple j. Speeding through 2018 with successful releases, an immense amount of internet attention and a tour up the east-coast of Australia. The duo shows no signs of slowing down, as IN OUTER SPACE is unleashed into the world. 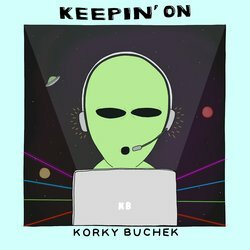 “Keepin’ On” came out of a heavy binge into Dirty Bird records. Drawing inspiration from those artists and throwing in their own unique style creating something that’s a hybrid between acid house and electro. “Keepin’ On” is engineered for dance floors in every way possible, made to get people moving throwing their hands right up. This is a wild one.